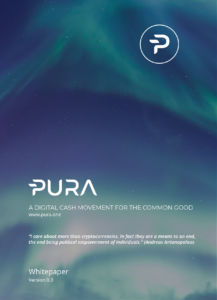 Home » BLOGCHAIN » Pura Coin » PURA Crypto News – Buy with cryptocurrencies! Spring is finally here, and after a long and cold winter, we all could benefit from a little retail therapy. While this author can’t speak for other Bitcoin and cryptocurrency enthusiasts, she knows a little about traveling, shopping, and treating herself with the help of digital currency. So, if you’ve been holding on to Bitcoin or well-performing crypto, now is a great time to buy with cryptocurrencies. So go ahead and take advantage of inventory clearances. Low air fares and an increasing number of services that participate in pay-by-coin services await you! More and more brick-and-mortar stores are now accepting Bitcoin as payment for goods and services. Many top websites are beginning to follow suit. Also, there are whole cities that either support small crypto communities and where you can buy with cryptocurrencies. And no Bitcoin blog would be complete without listing a few mind-blowing impulse-buying opportunities. So, for reference, or simply your reading enjoyment, below are several favorites. It’s true that only a small percentage of online retailers accept Bitcoin and crypto directly. However, many have begun to integrate crypto payment options through exchanges like Coinbase. These websites including Denver airport where you can use it to pay for parking. An increasing number of brick-and-mortar stores will take your coin as well. Overstock.com, the first to accept Bitcoin, has been this author’s premier go-to for online shopping. Opening on the heels of amazon.com and Ebay in 1999, Overstock.com quickly became one of the largest online retailers. Today, it’s not just peddling excess inventory. Payment processing for multiple cryptocurrencies is both fast and transparent. Are you a gadget junkie? If so, you’ll be glad to know that electronic retail giant Newegg.com has partnered with BitPay. Bitplaza makes shopping with bitcoin easy and addictive – the perfect place to buy with cryptocurrencies. Download the Bitplaza app and buy anything from the latest tech and gadgets, electronics, toys, gaming, sports equipment, and even groceries. Reeds jewelers is an American fine jeweler with both online and brick-and-mortar locations across the U.S. Although a family-run business, it’s known for exceptional lines of fine jewelry, custom jewelry, collectibles, and watches. Crypto enthusiasts are flexible trekkers and often book business and pleasure trips when the market is ripe. We hope you can tolerate being spammed on occasion. Yes? Because many of these sites distribute email newsletters promoting incredible deals for crypto-friendly travelers. Here is how you can buy with cryptocurrencies to your advantage when booking accommodations. CheapAir.com was the world’s first online travel agency to accept Bitcoin. They offer hotels, rental cars, and flights on all major airlines. Destinia.com is a Spanish travel agency that offers flights, hotels, hostels, rental cars, ski lift passes, and train tickets. Choose payment in fiat, or BTC or BCH. AirBaltic of Latvia has been accepting Bitcoin since 2014 for its discount flights to the Baltics, Russia, and Europe. 9Flats.com is Airbnb’s European rival headquartered in Berlin and accepts Bitcoin payments for short-term rentals. If you enjoy sushi and an authentic Japanese dining experience, The Mad Monkfish in Cambridge, Massachusetts is a five-star establishments now accepting Bitcoin. In the mood for Indian food? Try Khyber Tandoori Restaurant on Waterhouse Lane in London. Fisk & Skaldjur in Stockholm importing fresh seafood directly from Gothenburg, Sweden. This a modern seafood restaurants garnering rave reviews where you can buy with cryptocurrencies. Bread heaven is east of Amsterdam and tucked away in the Netherland forest. Here Bakkers met Vuur makes slow fermented artisan bread and baked goods in a wood fired oven. You are simply on-the-go and need a quick bite without the fuss of culling through crypto-participating restaurants? Beat the hunger pangs with Bitrefill. The mobile app allows users to purchase and download vouchers instantly. Eat at international fast-food burger, pizza, and Latin eateries like Chipotle, Papa Johns, Dominos, Burger King, The Cheesecake Factory and more. Once you’ve hit the ground, be sure to download the BitMapp App to your mobile device. While most Bitcoin ATMs charge exorbitant fees, you can’t beat the convenience when cash is the only option. Plus, most Bitcoin ATMs allow for generous daily withdrawals. The map also uses your location to find retailers, restaurants and cafes, jewelers, and merchants that accept Bitcoin and crypto around the world and in your immediate area. Cryptocurrencies are the gateway to a global decentralized ecosystem where users have complete fiscal autonomy to transact with whomever they choose for whatever they want. Keeping this in mind, it is no surprise that what people choose to buy with cryptocurrencies and to sell under the anonymity of public keys is rather strange. For practical purposes, this list meets parental guidance standards. The above categories only scratch the surface of the crypto market evolution. They also prove how far we’ve come on the journey to buy with cryptocurrencies from the days of Silk Road and the Dark Web that used Bitcoin to buy drugs and hitmen. As amusing as it is to see brick and mortar businesses jump on the crypto hype train, it’s also a great sign that mainstream culture is slowly embracing blockchain technology and the utility of a decentralized currency in everyday life.